Not knowing a whole lot about how Bela or Beaglebone Black work (I've just dabbled with Arduinos), would it be practical to embed Bela in a guitar pedal? 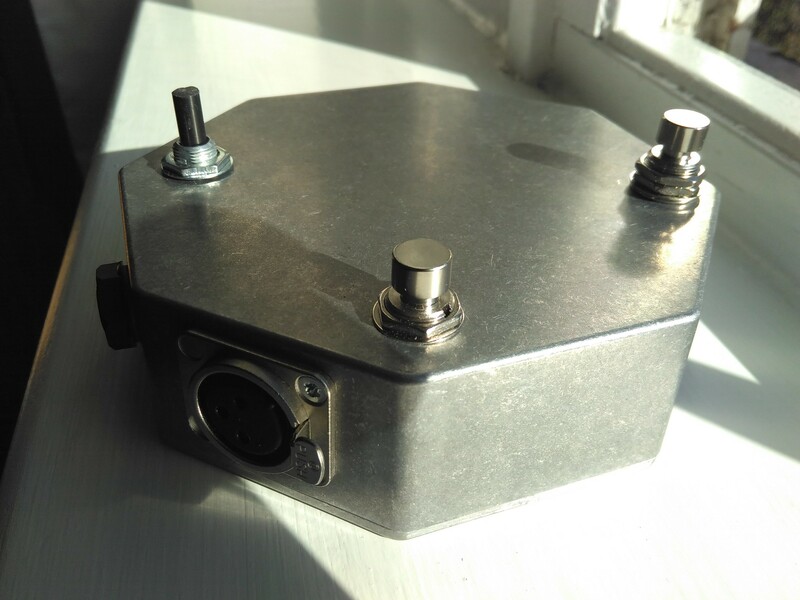 I attempted to build a guitar pedal based on the ElectroSmash pedalSHIELD, which is an Arduino Due shield, but we found out eventually that it doesn't fit properly in a metal enclosure. Therefore I'm looking to rethink this project around Bela. So, what we would need really is a hardware interface to Bela, with pots, switches, input and output jacks and a footswitch. Can one create an expansion board that plugs into the Bela in the same way as one would do for Arduino? You surely can design an expansion board that goes on top of Bela, in fact we do it ourselves for our capelets. Some care will have to be taken about hardware mount for board-mount pots and foot switches: you probably do not want the whole three-board stack to be suspended by the mounting hardware for the footswitch and pots. I would discourage board-mount footswitches, as I see how the durability of the board could be seriously compromised by it. If i was to do this, I would probably opt for panel-mount footswitch, switches and pots, especially considering the only external component you need is going to be a resistor for the switches. Also, make sure you look around the market to see if a stompbox case of the appropriate size is available around. Thanks for the input Giulio! I guess the controls should be connected to the board via wires then, right? I'm pretty new to electronics I have to admit, only assembling ready made designs so far. Which major components do you foresee I would need for this solution? A Bela, a custom expansion board for interfacing with the controls and jacks, anything else? Any of the capelets you mentioned? aknudsen you shouldn't need to make an extra board to do this with Bela. Unlike with the Arduino shield you linked to all of the ADCs, DACs and other audio-processing electronics are already setup on the Bela cape, so all you will need to do is connect your switches and pots (panel-mount is definitely best for these as @giuliomoro said) to the analog inputs of Bela with wires. Input and output jacks for the audio signal also come with the cape. As an added advantage, you will have several orders of magnitude more processing power with Bela than with an Arduino Due, and (possibly) lower latency. You shouldn't need the capelets for this project, unless you plan to have more than 8 analog inputs for your pots (the multiplexer capelet will handle up to 64 analog inputs at a lower sampling rate). Thanks @LiamDonovan! Where do I find a concrete description of the Bela cape's inputs and outputs? I was looking on bela.io, but couldn't find it. The plan is to have a workshop where we create these guitar pedals (Bela inside), would anyone have any suggestions for the software we should use for the FX themselves? I guess Pure Data is perhaps the most suitable from an educational perspective? http://bela.io/belaDiagram/ or you can find it through the IDE. PureData, Faust, SuperCollider, C++, pyo are probably all suitable for making guitar effects and education, it really depends on the focus of the workshop and the background of your participants! What are the exact dimensions of Bela? aknudsen sorry for the slow reply! Width and depth are the same as the BeagleBone (approx 55mm x 90mm). The maximum height is approximately 30mm, though this depends how hard you squish the cape onto the connectors, and is not even because the USB connector sticks out a bit. Definitely something I want to do as well. I already have the C++ code, just not 100% sure the Bela is fast enough for the most complicated parts. matthieub what are the most complicated parts of your code? We may be able to give you an indication at least of whether Bela is powerful enough for your application. I have some Newton Raphson processing to model tube distrotion/preamps. I haven't tried float precision yet, haven't had the time to do everything I want! great ! do you have the part number handy ? @matthieub @danstowell Have you guys open sourced your guitar pedal Bela projects? I would love to learn how you do this! I'm a novice when it comes to building guitar pedals and audio signal processing, but I'm interested in crafting a Bela guitar pedal as a fun hobby project, and as a topic for doing workshops at the local Fab Lab! aknudsen Hi, and sorry for the late reply, stuck with too many things to do. Yes, my code is open source and available. I'm currently trying to fix some compatibility issues as I moved on Windows, Linux and OS X to full C++11 code, and there are some bits missing on the BeagleBoard. Shouldn't be too hard though. danstowell Great! But the rest of your software for the pedal hasn't been released?